Also known as the sunshine vitamin, is produced by the body as a response to sun exposure; it can also be consumed in food or supplements. Having enough vitamin D is important for a number of reasons, including maintaining healthy bones and teeth; it may also protect against a range of conditions such as cancer, type 1 diabetes, and multiple sclerosis. Vitamin D is actually not a vitamin. Despite the name, vitamin D is considered a pro-hormone and not actually a vitamin. Vitamins are nutrients that cannot be created by the body and therefore must be taken in through our diet. However, vitamin D can be synthesized by our body when sunlight hits our skin. It is estimated that sensible sun exposure on bare skin for 5-10 minutes 2-3 times per week allows most people to produce sufficient vitamin D, but vitamin D breaks down quite quickly, meaning that stores can run low, especially in winter. Recent studies have suggested that a substantial percentage of the global population is vitamin D deficient. 1) Vitamin D for healthy bones – Vitamin D is vital for bone health. Vitamin D plays a substantial role in the regulation of calcium and maintenance of phosphorus levels in the blood, two factors that are extremely important for maintaining healthy bones. We need vitamin D to absorb calcium in the intestines and to reclaim calcium that would otherwise be excreted through the kidneys. Vitamin D deficiency in children can cause rickets, a disease characterized by a severely bow-legged appearance due to softening of the bones. In adults, vitamin D deficiency manifests as osteomalacia (softening of the bones) or osteoporosis. Osteomalacia results in poor bone density and muscular weakness. Osteoporosis is the most common bone disease among post-menopausal women and older men. 2) Reduced risk of flu – Children given 1,200 International Units of vitamin D per day for 4 months during the winter reduced their risk of influenza A infection by over 40 percent. 3) Reduced risk of diabetes – Several observational studies have shown an inverse relationship between blood concentrations of vitamin D in the body and risk of type 2 diabetes. In people with type 2 diabetes, insufficient vitamin D levels may negatively effect insulin secretion and glucose tolerance. In one particular study, infants who received 2,000 International Units per day of vitamin D had an 88 percent lower risk of developing type 1 diabetes by the age of 32. 4) Healthy infants – Children with normal blood pressure who were given 2,000 International Units (IU) per day had significantly lower arterial wall stiffness after 16 weeks compared with children who were given only 400 IU per day. Low vitamin D status has also been associated with a higher risk and severity of atopic childhood diseases and allergic diseases, including asthma, atopic dermatitis, and eczema. Vitamin D may enhance the anti-inflammatory effects of glucocorticoids, making it potentially useful as a supportive therapy for people with steroid-resistant asthma. 5) Healthy pregnancy – Pregnant women who are deficient in vitamin D seem to be at greater risk of developing preeclampsia and needing a cesarean section. Poor vitamin D status is associated with gestational diabetes mellitus and bacterial vaginosis in pregnant women. It is also important to note that high vitamin D levels during pregnancy were associated with an increased risk of food allergy in the child during the first 2 years of life. 6) Cancer prevention – Vitamin D is extremely important for regulating cell growth and for cell-to-cell communication. Some studies have suggested that calcitriol (the hormonally active form of vitamin D) can reduce cancer progression by slowing the growth and development of new blood vessels in cancerous tissue, increasing cancer cell death, and reducing cell proliferation and metastases. 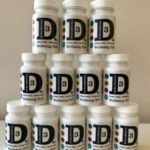 Vitamin D influences more than 200 human genes, which could be impaired when we do not have enough vitamin D.
Buy Vitamin D tablets online from our website here. The amount of vitamin D you need depends on your age. Vitamin D intake can be measured in two ways: in micrograms (mcg) and International Units (IU). One microgram of vitamin D is equal to 40 IU of vitamin D.
Although the body can create vitamin D, there are many reasons deficiency can occur. For instance, darker skin color and the use of sunscreen reduce the body’s ability to absorb the ultraviolet radiation B (UVB) rays from the sun needed to produce vitamin D.
A sunscreen with sun protection factor (SPF) 30 can reduce the body’s ability to synthesize the vitamin by 95 percent. To start vitamin D production, the skin has to be directly exposed to sunlight, not covered by clothing. People who live in northern latitudes or areas of high pollution, work at night and stay home during the day, or are homebound should aim to consume extra vitamin D from food sources whenever possible. Infants who are exclusively breast-fed need a vitamin D supplement, especially if they are dark-skinned or have minimal sun exposure. The American Academy of Pediatrics recommends that all breastfed infants receive 400 IU per day of an oral vitamin D supplement; drops made specifically for babies are available. Although vitamin D supplements can be taken, it is best to obtain any vitamin or mineral through natural sources wherever possible. Vegetarians, vegans and elderly at higher risk of B12 deficiency Researchers have found that vegetarians, vegans and the elderly face a higher risk of vitamin B12 deficiency as a result of changes to their diet.